In 1946, the archdiocese of Grand Rapids, Michigan opened a new church in the Indian River area of northern Michigan. Although the local congregation consisted of only twelve families, the Diocese recognized the need to service the large number of Catholics who vacationed in the region during the summer months. Following the appointment of Fr. Charles Brophy as the first pastor, plans began to take shape for a shrine that would attract tourists from throughout the country. Inspired by the church’s woodland setting, Fr. Brophy envisioned an indoor church for residents and an open-air church for summer visitors. The archdiocese commissioned prominent architect Alden B. Dow to design the church. At the longhouse-style church’s dedication in 1950, Fr. Brophy announced plans for a Calvary Hill with a large wooden cross. In order to attract the attention of passing tourists, Fr. Brophy decided to erect the world’s largest crucifix. After a two year delay, the archdiocese granted permission for Fr. Brophy to proceed with his plans and construction of the cross’ foundation at the rear of the property commenced. A printing plant owner from Indianapolis donated the enormous redwood cross in memory of his late wife. Erected in 1954, the cross stands fifty-five feet high atop a hill overlooking Burt Lake. Considered by Fredericks to be “his greatest challenge,” the figure of Christ took him four years to complete. Funded by contributions from over 10,000 summer visitors to the shrine, the twenty-eight foot corpus symbolizes a Christ on the cross who is still living. Fredericks chose to depict the figure without a crown of thorns or a spear wound in its side. In this design, he “wanted to eliminate the suffering and agony for the observer and give the face an expression of great peace and strength.” One day, discouraged by the challenge and long days and nights at work on the face of Christ, Fredericks came upon a worker cleaning in the studio, on his knees in front of the clay form. Fredericks knew then he was on the road to achieving his goal. Since its dedication in 1959, millions of pilgrims from around the world have traveled to Indian River, Michigan to visit the shrine and see Fredericks’ work. 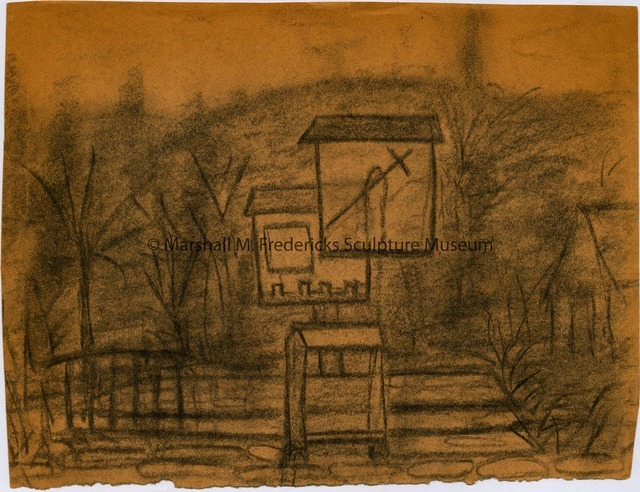 Fredericks, Marshall M., 1908-1998, “Sketch for Stations of the Cross at Indian River Catholic Shrine,” Marshall M. Fredericks Sculpture Museum, accessed April 22, 2019, http://omeka.svsu.edu/items/show/6560.